Johannes Brahms himself produced a four-handed version of his German Requiem for piano that was publicized first in London in 1871. The publication of simplified musical versions for piano duo was common in the 19th century, being in some respects the precursor of acoustical recording because it allowed musical amateurs to experience great works outside the concert hall by their own performance on the piano. Brahms worked on this version himself, i.a. out of the conviction that if it really had to happen, he would be the best candidate for this duty. All in all, he considered this work as unworthy, but necessary, thus he refused noting his name as arranger on the front page, and as it happened anyhow, he ordered the exemples already printed to be recollected and added with new front pages not naming him as arranger any longer. In a letter Brahms stated ironically: 'I dedicated myself to the noble occupation of rendering my immortal creation enjoyable also for the four-handed soul. Now it can't decline.'. Even if it obviously didn't answered the Maestro's basic idea, the piano version gives considerably more room for dynamics and therefore serves the tension of the work. Prior condition is a choir and a conductor that see an opportunity and even are challengend by the minimalism of the instrumentation in filling these deep moments with all the tension human voice is capable of. The vocal performance is enriched by the convertion of the piano version by Brahms himself, because he in person decided on the atmospheric form of his presentation. It is quite exciting to hear the chamber choir merge into word and work and having the courage of dedicating itself to the Requiem's spirit. The Maulbronn Chamber Choir was founded in 1983 and counts today as one of the renowned chamber choirs in Europe. Awards like the first places at the Baden-Württemberg Choir Competitions in 1989 and 1997, the second place at the German Choir Competition in 1990, the first prize at the German Choir Competition in 1998, the second place at the International Chamber Choir Competition in Marktoberdorf 2009 and the first place at the Malta Choir Competition show the extraordinary musical calibre of this ensemble. The Chamber Choir has managed to make quite a name for itself on the international scene, too. It was received enthusiastically by audiences and reviewers alike during its debut tour through the USA in 1983, with concerts in New York, Indianapolis and elsewhere. 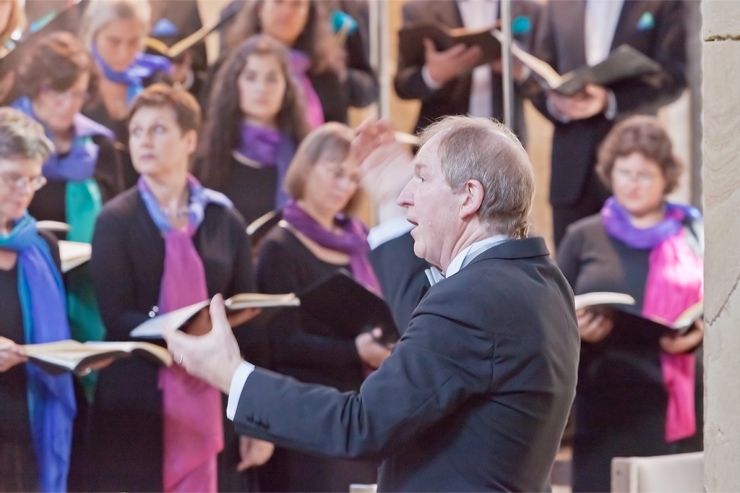 Its concert tours in many European countries, in Israel and Argentina as well as in South Africa and Namibia have also met with a similar response.The Chamber Choir has managed to make quite a name for itself on the international scene, too. It was received enthusiastically by audiences and reviewers alike during its debut tour through the USA in 1983, with concerts in New York, Indianapolis and elsewhere. Its concert tours in many European countries, in Israel and Argentina as well as in South Africa and Namibia have also met with a similar response. Heidi Elisabeth Meier is considered an exceptional phenomenon among up-and-coming soloists and can already look back on numerous successes in concerts, operas and song. The soprano, who was a member of the Bayerische Singakademie from an early age and completed her studies with honours under Adalbert Kraus at the academy of music in Munich, has performed in concert with the Münchener Symphoniker under Prof. Schneidt, the Münchener Bach-Chor under Christian Kabitz, the Deutsches Sinfonieorchester Berlin under Kent Nagano and the Ensemble für neue Musik. In 2003 she debuted at the Gärtnerplatz Theatre and elsewhere. Andreas Grau and Götz Schumacher, with their talent for putting together clever and innovative programs, have established themselves as one of the world's top piano duos. Their cooperation at the piano is evidence that the two expert pianists are nothing short of musical soul mates. The vast breadth of the duo's expressiveness has garnered it invitations to various festivals and concert halls, such as the Kölner Philharmonie, Berliner Philharmonie, Cité de la Musique Paris, Schwetzinger Festspiele, Salzburger Festspiele, Tonhalle Zürich, and the Piano Festival La Roque d'Anthéron, and has resulted in collaborations with renowned conductors such as Michael Gielen, Lothar Zagrosek, Emanuel Krivine, Heinz Holliger, Kent Nagano, Bertrand de Billy, Andrej Boreyko, Georges Prêtre, and Zubin Mehta. The pair's most recent projects have included concerts with the Deutsches Symphonie-Orchester, Konzerthausorchester Berlin, Stuttgart Radio Symphony Orchestra, Bavarian State Orchestra, Vienna Radio Symphony Orchestra, and the Orchestre National de Lyon, as well as performances at the Lucerne Festival, the Wiener Konzerthaus, and the Concertgebouw Brugge. Their keen ability to conceive well-considered program concepts is also evident in their recordings. Their album of Stockhausen's Mantra won awards from Le monde de la musique and Diapason. Gramophone selected their CD Visions de l'Amen, featuring works by Messiaen and Schütz/Kurtág, as Editor's Choice. Jürgen Budday (born 1948) is conductor, director of church music, music teacher and artistic director of the concert series at the UNESCO World Heritage Site Maulbronn Abbey. He started teaching at the Evangelical Seminar in Maulbronn in 1979. This also involved his taking over as artistic director of the Maulbronn Monastery Concerts and the cantor choir. He studied church music and musicology at the Academy of Music in Stuttgart from 1967 to 1974. In 1992, he was named Director of Studies, in 1995 came the appointment as Director of Church Music and in 1998 he was honored with the "Bundesverdienstkreuz" (German Cross of Merit) as well as the Bruno-Frey Prize from the State Academy in Ochsenhausen for his work in music education. 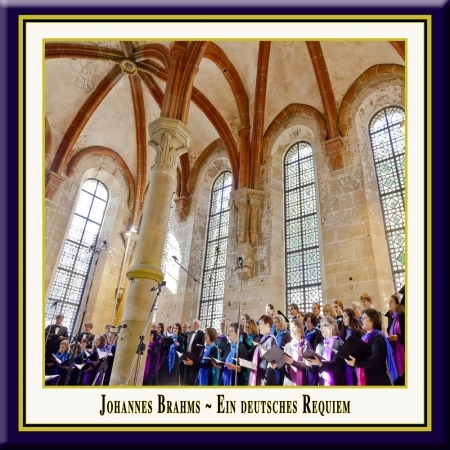 In 1983 Jürgen Budday founded the Maulbronn Chamber Choir (Maulbronner Kammerchor) with whom he won numerous national and international awards. At the Prague International Choir Festival, for example, Jürgen Budday received an award as best director. Since 2002, he has also held the chair of the Choral Committee of the German Music Council and became director and jury chairman of the "German Choir Competition" (Deutscher Chorwettbewerb). In 2008, he received the silver Johannes-Brenz-Medal, the highest honoring of the Evangelical-Lutheran Church in Wuerttemberg. For his achievements as a conductor, as educator and as musical ambassador of the country, Jürgen Budday was honoured in 2011 with the honorary title "Professor". Jürgen Budday has started a cycle of Handel oratorios that is planned to span several years, which involves working with soloists like Emma Kirkby, Nancy Argenta, Miriam Allan, Michael Chance and Mark Le Brocq (to name but a few). The live recordings of these performances, that have received the highest praise from reviewers, has won him international recognition. Till these days 10 oratorios by G.F.Handel are documented on discs. "No conductor and no choir have so consistently recorded so many Handel oratorios as Jürgen Budday and his Maulbronn Chamber Choir" (Dr. Karl Georg Berg, Handel Memoranda Halle 2008).